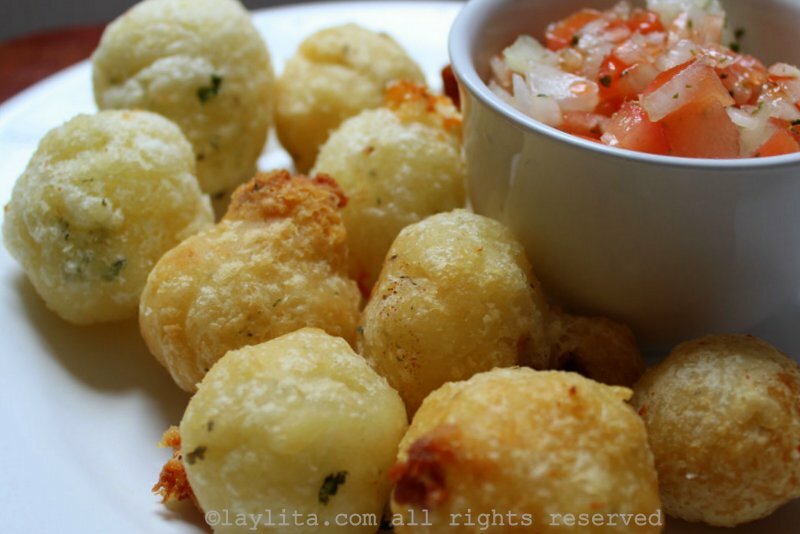 Easy recipe for fried manioc or cassava balls stuffed with cheese or meat. 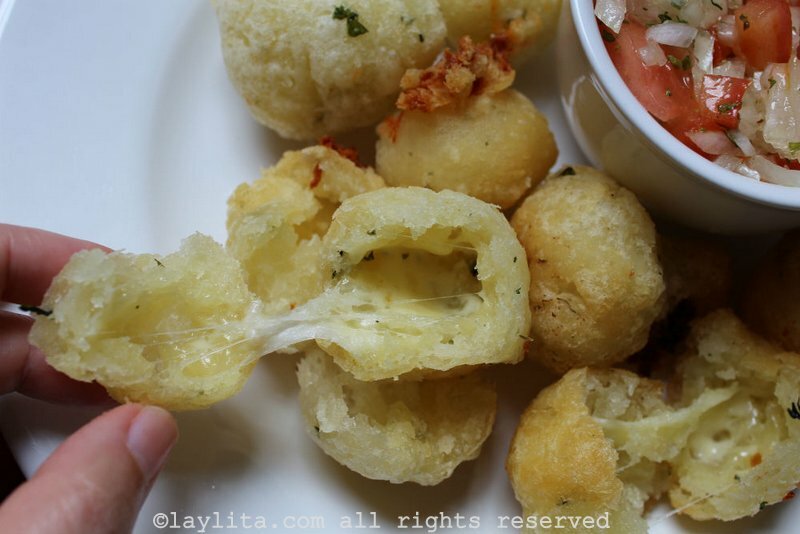 This delicious Brazilian snack,called “Bolinho de Macaxeira” is like a fried dumpling or fritter made with manioc (yuca/cassava root) and a cheesy filling;and can be served as an appetizer. This recipe and text is contributed by our guest blogger Andressa Vieira. 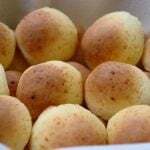 These delicious and filling cassava balls stuffed with cheese are made with cassava, yuca, or manioc (also called “macaxeira” or “aipim” in Brazil). It’s a popular snack in my country, usually served at bars, pubs or family/ friends’ gatherings. 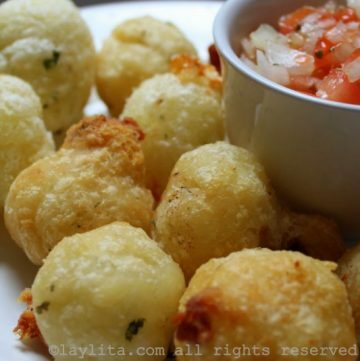 These fried mashed yuca or cassava balls go well with an endless variety of fillings and sauces. In my hometown, we usually fill it with shredded jerk(charque desfiada), and with or without cheese. 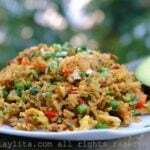 But you can also use ground sausage, shredded or ground meat, chicken and even shrimps. “Charque” is a kind of jerk beef very common in Brazil’s northeast, a little tricky to prepare. It’s extremely salty, made to last for along time, even out of the fridge. This was necessary because it’s a typical food from “sertão”, the semi-arid region of Brazil, known for its long droughts. Many people who live there still have no fridge. If you fill these balls with charque, don’t add more salt to the dough. Manioc or cassava is one of the staples of northeast cuisine,together with coconut (dry of fresh). It’s a root, made out almost exclusively of water and starch. It doesn’t have many nutrients, but it offers a good amount of energy and it’s very filling. Its very mild flavor makes it suitable to prepare savory or sweet dishes alike. We eat manioc cooked with butter, cheese or meat, eggs and sardines; or fried, with shredded Parmesan cheese over it. Also, “escondidinho de macaxeira” (grated manioc puree with shredded jerk and coalho cheese),manioc cake, “pé-de-moleque” cake, Souza Leão cake, and many others. Indigenous people in Brazil used to grate the manioc and put it to dry under the sun. It then becomes another of our treasures: manioc flour, which we use in everything. Manioc cooks in about 20 minutes, more or less. It’s good when it “cracks” and opens itself, and becomes soft, but still resistant.Some types become a puree easily, which is also good, but not for this recipe. If you live in North America/Europe it is harder to find fresh cassava or manioc, and when you find it’s not usually the best quality. However, it has become easier to find it frozen (of better quality) at most Latin – and surprisingly Asian supermarkets.If you cook it from frozen it will take a little longer, about 40 minutes to cook until tender. Some recipes add egg and flour to the dough, to make it easy to mold the balls. It’s a popular version, but I don’t like it, because I find it too dense and “sweet”, because of the increased amount of starch. Remember that manioc consists almost only of water + starch. But I’ve also prepared this version, and if you want to try it, add an additional cup of smashed manioc, one egg and two tablespoons of flour. If the dough is too sticky to mold, don’t put more flour, and use two spoons to fry the balls in the oil. There’s also step by step pictures showing how to peel the manioc. Even in Brazil, many stores sell it already unpeeled and frozen. This way, it lasts forever, if you keep it frozen. When you decide to cook it, boil some water with salt. When it’s boiling, add the manioc still frozen in the water. If you buy it fresh with the bark, make a longitudinal shallow cut, fit the knife inside the cut and take the peel out, the brown one and also the inner skin, white and resistant, which can also be pinkish. After you get used to it, it’s easy! 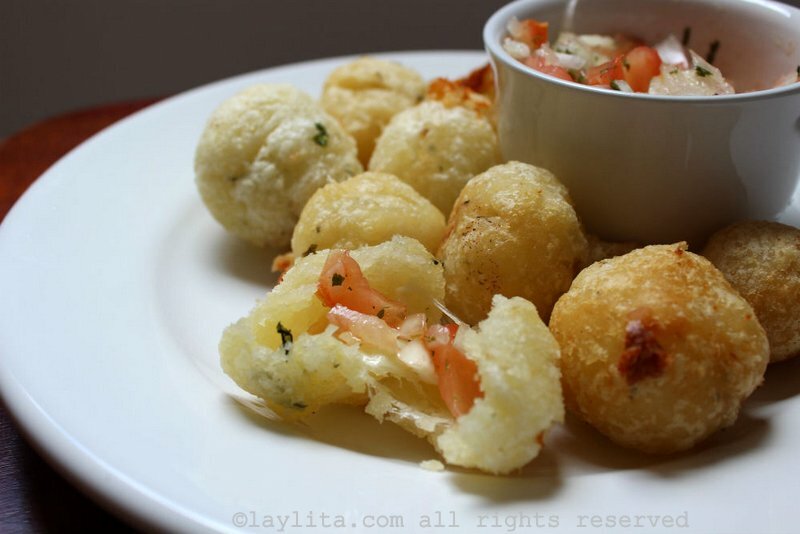 Delicious and filling fried manioc or cassava balls made with manioc (yuca / cassava root) and a cheesy filling. These cassava style dumplings or fritters can be served as a snack or appetizer. 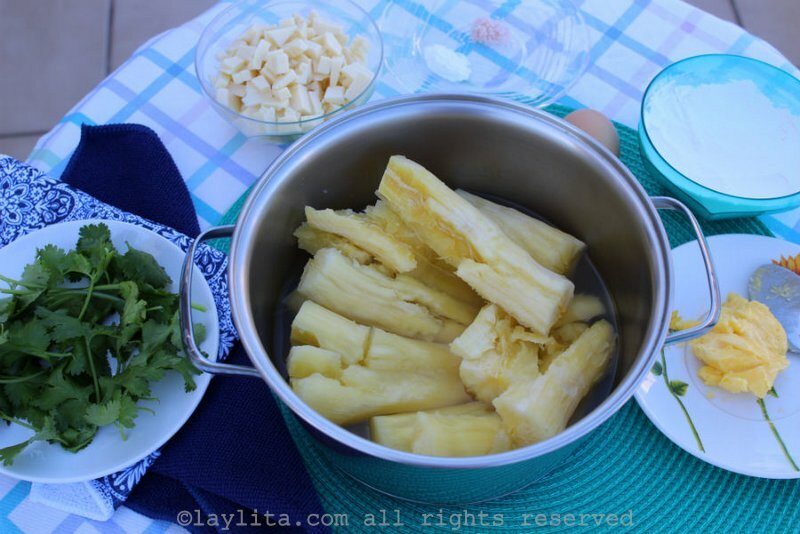 Cook the manioc or cassava in water and salt, but don’t let it get too soft. You’ll know when it’s ready when you stick it with a fork and it opens itself. If you are cooking fresh cassava, it will take about 20-30 minutes to cook, depending on how young it is. If you are cooking it from frozen, then it will take closer to 40 minutes. Keep an eye on it during the last minutes to make sure it doesn’t overcook. Drain all the water, remove the center stringy part of the cassava (if you didn’t remove them before boiling), and smash the cassava while still hot with a fork. Don’t let it cool off, otherwise it becomes hard to mash. Add the butter and mix well with a wooden spoon. Add salt, pepper and fresh cilantro/parsley. Taste and add more seasonings, if needed. If the dough is dry, you can add additional butter or oil as needed. Mold the dough into little balls and fill each one with cheese (and meat if using). Coat them with flour or breadcrumbs. For best results you can refrigerate the cassava balls for 30 minutes to an hour before frying – this will help keep the cheese filling from leaking out while frying. Fry the mashed cassava balls in hot oil, the oil must be very hot, otherwise the balls will be mushy. 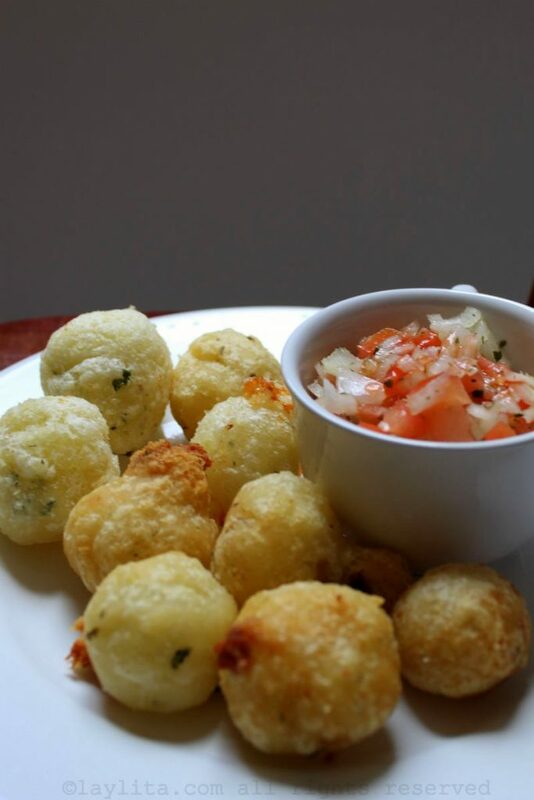 Serve the warm fried mashed cassava or manioc balls with a dipping sauce. I suggest a chilli sauce, a salsa rosada or golf sauce (ketchup mixed with mayonnaise), or a tomato onion curtido style salsa. To try the variation of this recipe that has egg and flour in the dough, you can add an additional cup of mashed manioc, one egg, and two tablespoons of flour. The dough might be more sticky and harder to mold, so you can use two spoons to mold it and transfer to the oil for frying. 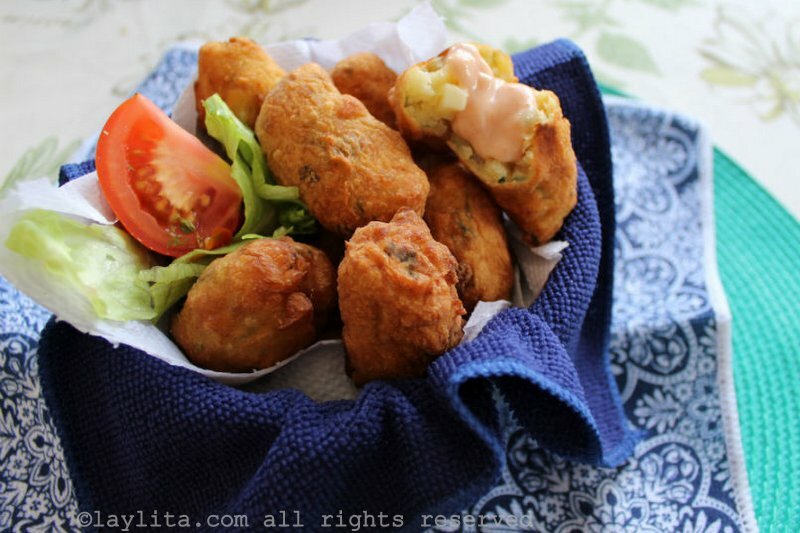 Looks so yummy:) My Colombian friend makes cassava cheese rolls, the idea is a bit similar.